Getting Ko Lanta, Transportation to Ko or Koh Lanta, Krabi Phuket Trang flight schedule to Ko Lanta island. The airport nearest to Ko Lanta is in Krabi. It is possible to get a connecting flight, but sometimes difficult as fewer airlines fly to Krabi. Once landed in Krabi, you can get connection from Krabi to Ko Lanta by boat and mini-van. Check with links to see avialable flight operator to Krabi. Or visit Krabi airport for more information. The second nearest airport to Ko Lanta is within the Trang Province . It‘s about 90 kms distance, approximately 2 hours, to get from Trang to Ko Lanta by mini-van. Check with links to see avialable flight operator to Trang. Or visit Trang Airport for more information. Getting a flight to Phuket airport is the third closest to Ko Lanta, but offers the chance for comfortable, scenic drive to reach the island. The journey covers a distance of about 250 kms and takes roughly 4 hours. During the high season (mid-October to mid-March) there is a ferry service connecting the two islands that runs via Ko Phi Phi. The trip takes approximately 4 hours and tickets cost around 700 baht per person. And new route minivan from Phuket to Ko Lanta is available now. Lantainfo.com helps you to manage your flight planning by online update link to any airline available to Phuket airport. Click your prefer airline for and update schedule below. Check with links to see avialable flight operator to Phuket. Or visit Phuket internation airport for more information. There are four bus stations on each corner of Bangkok . 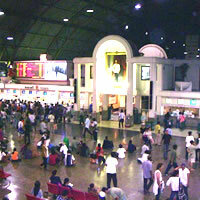 If you are traveling South, go to the Sai Tai Mai station (Sai means Route, Tai means South, Mai means New). There is normally no need for advance booking – in fact tickets can usually be purchased as late as just a few hours before departure. The notable exceptions are on special Thai holidays and long holidays. The bus service starts around 17:00 daily. Bear in mind, the bus will get to Krabi at 05:30 am., But the first public minivan from Krabi to Ko Lanta starts at 09.00-10.00 am. If you don't want to wait, you can find a private Taxi from agent tour near bus station to Ko Lanta, or if you want to save your money, you will need to wait somewhere for around 4 hours to get a first van from Krabi-Ko Lanta. 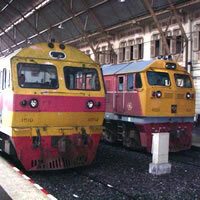 There are two trains running daily from Bangkok to Trang. The service was a state-owned business previously, so don't expect a classy service – however, the standard of cleanliness is good and the price fair. 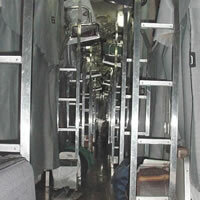 The first class train has separate cubicles with 2 seats in each one. The seats convert to beds at night with hygienically packed pillow and sheets provided. 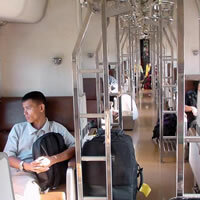 The lower berth is priced at around 1,400 baht and the upper at 1,200 baht. 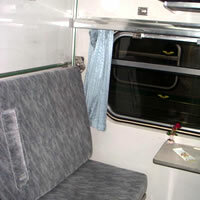 The second class carriages come with a choice of Air-con or fan. 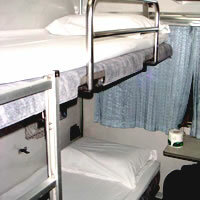 The seats convert to beds as in first class, also with pillow and sheets supplied. The lower bed price is around 700 baht, the upper around 600 baht. The Fan cabin price is slightly cheaper than that for Air-con. There is restaurant cabin on the train supplying food and drink - you can order the food to be brought to your seat or stretch your legs and walk to restaurant cabin. The prices are fair for standard fare. To experience some local flavour, try buying the food from the vendors who step aboard at different stations, and the fruit-sellers at the windows.